This chapter concerns about perioperative anaesthesiologic management of liver transplantation. Liver cirrhosis and its complications often involve different organs whose derangements could severely worsen postoperative outcome; hence, their preoperative diagnosis and treatment are fundamental; the first part of this chapter describes the most frequent complications of cirrhosis and their implications in preoperative care. Liver transplantation is a challenging task for the anaesthesiologist because of the risk of bleeding, cardiovascular derangements, coagulation impairment and metabolic disturbances; the second part of this chapter describes the main anaesthetic and monitoring techniques used for liver transplantations and the most important intraoperative problems which need to be faced by the anaesthesiologist in each phase of the intervention. 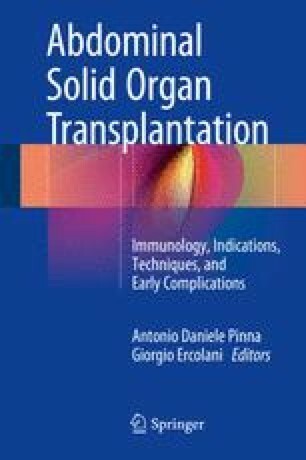 Early postoperative management of liver transplant recipients is crucial because of their comorbidities and the potential surgical and medical complications of the intervention; the third part of this chapter describes the ICU management after liver transplantation and the main medical complications for every organ system that needs a critical care approach. Henry DA, Carless PA, Moxey AJ, O’Connell D, Stokes BJ, Fergusson DA, et al. Anti-fibrinolytic use for minimising perioperative allogeneic blood transfusion. Cochrane Database Syst Rev. 2011;(1):CD001886. doi: 10.1002/14651858.CD001886.pub4. Gurusamy KS, Pissanou T, Pikhart H, Vaughan J, Burroughs AK, Davidson BR. Methods to decrease blood loss and transfusion requirements for liver transplantation. Cochrane Database Syst Rev. 2011;(12):CD009052. doi: 10.1002/14651858.CD009052.pub2. Ventilation with lower tidal volumes as compared with traditional tidal volumes for acute lung injury and the acute respiratory distress syndrome. The Acute Respiratory Distress Syndrome Network. N Engl J Med. 2000;342:1301–8. doi: 10.1056/NEJM200005043421801.